This stunning book is the first compendium of art made with ballpoint pens. It features 30 artists from around the world who are currently making masterpieces with this humble tool. They create works on wallpaper, canvas, sculpture, enormous sheets of paper and even buildings, depicting a wide range of subjects – from densely layered portraits to abstract scribbles. These artists pick up the pen for many reasons: for its ubiquity and everydayness, for the particular feel of ballpoint ink and even sometimes for its difficulty. 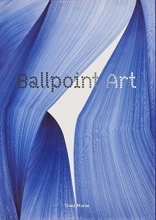 Ballpoint Art is a compelling showcase of the remarkable ends to which they put this highly accessible tool.